Day 3: October Oyster Push "No Nap Time"
David Kimbro’s crew has been split into two teams, the Net/Trap team (N/T) and the Tile team (TI). For a closer look at how David’s team nets and traps larger fish and crabs, click here. To learn more about what the Tile team will be doing, click here. And if you click On the Reef under categories in the sidebar, you can track David’s progress over the course of this study. 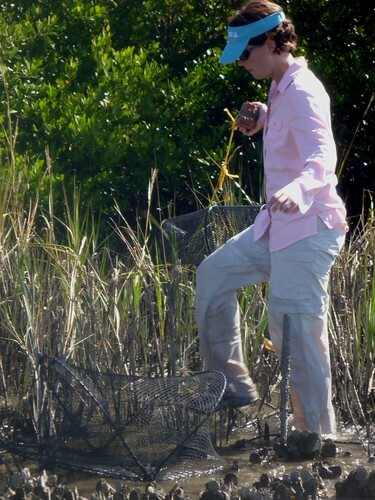 Randall places traps on a Cedar Key reef. After months of walking around In the Grass, Dr. Randall Hughes stepped out On the Reef Sunday, pitching in for some fieldwork with David’s tech, Hanna Garland. They were the Net / Trap team working Cedar Key, while Tanya Rogers is heading up the Tile team in Saint Augustine. Randall, in addition to heading the salt marsh biodiversity study we also follow on this blog, is the co-PI (Primary Investigator) on this biogeographic oyster study. With her other study taking so much of her time and David having things well in hand with this one, she hadn’t made it out into the field until Sunday. We tagged along with her today. This was our first time documenting this study outside of Alligator Harbor (which is located a short hour from WFSU-TV) and, actually, it was my first time on any oyster reef other than those. 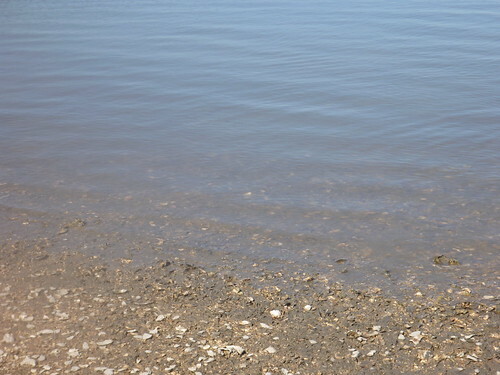 I noticed that the water was a little clearer- I could actually see some of the oyster clumps for a foot or so under water as opposed to not at all. Few of the oyster reefs were as large as in AH, tending more often than not to stay a collection of clumps than an expansive reef. There were also stretches where reefs had been, and all that remained were broken shells. Randall told me that these had either been harvested or that the reefs had just plain failed (Tanya recounted finding two of the Cedar Key reefs obliterated in her last post). Scientific equipment being used in an entirely lawful way. This machine filters the sediment floating in the water- including the phytoplankton that oysters eat. If you take a look at the schedule below, you can see that the events are spread out based on the tide schedule; and there are a couple of days during this push where they start around sunrise and work well into the night. So there are breaks from fieldwork built into the day. I had assumed that this would be “nap time.” To my surprise, this is actually “lab time.” The water samples they had taken on our boat ride had to be filtered, and the filters frozen as fast as possible to prevent bacteria from contaminating them. 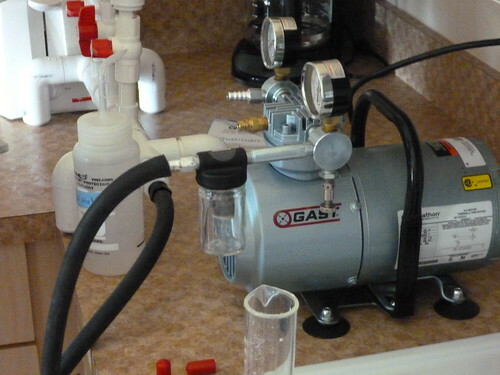 They set up their “lab” in the kitchen of a condo they were renting. The apparatus they use is a collection of PVC pipes, tubing, and a motor into which they pour the liquid from clear test tubes. Randall had seen a news story this last week where some college kids were arrested for turning their dorm room into a crystal meth lab. She wondered aloud whether someone looking in their window might suspect the same of her and Hanna. Boating from reef to reef, we would see places like this where a reef had been decimated. Two of the original Cedar Key sites for this study were destroyed. These are the kinds of things that happen outside of the controlled environment of a laboratory. 12:23 PM– Deploy traps, collect spat sticks, water samples. They once again made use of the new boat, though the public boat ramp is on the other side of the island from where their sites are located. They were going to look for a boat ramp closer to their sites to save a little more time. The spat sticks so far have only collected barnacles at all of their sites, meaning that they may have started using them past the season in which oysters spawn. 6:00 PM– Retrieve traps, High tide activities: reference water level, replace spat sticks (if possible). 9:00 PM– Deploy nets. Randall and Hanna will retrieve these in the morning before Hanna heads to Saint Augustine to meet up with David Kimbro and the rest of the crew. 1:00 PM– Tanya Rogers and new crew member Cristina drive to Saint Augustine.